O valiant woman! support of the Church in most unhappy times, mayst thou now be blest by all nations! When the earth, grown poor in virtue, no longer paid its debts to the Lord, thou wast the treasure discovered and brought from the uttermost coasts to supply for the indigence of many. Thou didst earn the good-will of heaven for the hitherto despised north. Then the holy Spirit was moved by the prayers of apostles and martyrs to lead thee to the land which their blood had not sufficed to render fruitful for the Spouse; thou didst appear as the merchant’s ship bringing bread from afar to countries wasted and barren. At thy voice, Rome took heart again; after thy example, she expiated the faults which had wrought her ruin; thy prayers & hers won back to her the heart of her Spouse and of His vicar. Give ear to us, O God our Saviour, that as we celebrate with joy the solemnity of blessed Bridget, so we may improve in the affection of true piety. Through our Lord Jesus Christ, thy Son, who liveth and reigneth with thee, in the unity of the Holy Ghost, God, world without end. Amen. Click here, for the Fifteen Prayers of St. Bridget, to be said in honour of the Sacred Wounds of our Blessed Saviour. ‘Who, O Lord, has treated Thee thus?’ ‘They that despise Me and forget My love.’ This was the first revelation of the Son of God to Bridget of Sweden. Francis of Assisi, raising before the world the standard of the cross, had announced that Christ was about to recommence the dolorous way; not now in His own Person, but in the Church, who is flesh of His flesh. The truth of this declaration Bridget experienced from the very opening of that fatal fourteenth century, during which such innumerable disasters, the results of crime, fell at once upon the west. Born in the year when Sciarra Colonna, a new Pilate’s servant, dared to strike the Vicar of Christ, Bridget’s childhood was contemporaneous with those sad falls, which caused the Church to be despised by her enemies. There were no saints in Christendom comparable to the great ones of old; in the preceding age the Latin races had exhausted their vitality in producing flowers; but where were the promised fruits? Ancient Europe had nought but affronts for the Word of God; this feast, this apparition of Jesus in cold Scandinavia, seems to point to His flight from the habitual centre of His predilection. Bridget was ten years old, when the Man of sorrows sought a resting-place in her heart: and at that very time, the death of Clement V and the election of John XXII in a foreign land, fixed the papacy in its seventy years’ exile. Rome meanwhile, widowed of her Pontiff, appeared the most miserable of cities: ‘The ways of Sion mourn, because there are none that come to the solemn feast.’ (Lam, i. 4) Sacked by her own sons, she was daily losing some remnant of her ancient glory; her public roads were scenes of bloodshed; solitude reigned amid the ruins of her crumbling basilicas; sheep grazed in St. Peter’s and the Lateran. From the seven hills anarchy had spread throughout Italy, transforming the towns into haunts of brigands, and the country parts into deserts. France was doomed to expiate, in the horrors of a hundred years’ war, the captivity of the sovereign Pontiff. The criminal coldness of the south had been the occasion of grace for the north; but the latter in its turn did not profit by the time of its visitation: and Bridget quitted it for ever. She herself was a city of refuge to our Lord. Taking up her abode in Rome, she there, by her holiness, prepared the way for the return of Christ’s vicar. There for twenty years she, as it were, personified the eternal city, enduring all its bitter sufferings, knowing all its moral miseries, presenting its tears and prayers to our Lord; continually visiting the tombs of the apostles and martyrs throughout the peninsula; and at the same time never ceasing to transmit to Pontiffs and kings the messages dictated to her by God. Before reading the liturgical legend, let us call to mind that St. Bridget died on July 23, 1373; October 8 is the anniversary of the first Mass celebrated in her honour by Pope Boniface IX on the day following her canonization. Martin V confirmed the Acts of Boniface IX in her honour; and approved her Revelations, which had been violently attacked in the Councils of Constance and Basle, only to come forth with a higher recommendation to the piety of the faithful. Many Indulgences are attached to the rosary which bears the saint’s name. These are now, by the favour of the apostolic See, frequently applied to ordinary rosaries; but it must be remembered that the true rosary of St. Bridget is composed of the Ave Maria recited sixty-three times, the Pater noster seven times, and the Credo seven times, in honour of the supposed number of our Lady’s years on earth, and of her joys and sorrows. It was also from a desire of honouring our Lady, that the saint vested in the abbess the superiority over the double monasteries in the Order of our Saviour. Let us read the liturgical legend, which the Church provides us on this day. Ulfo became a Cistercian monk, but died soon afterwards. Whereupon Bridget, having heard the voice of Christ calling her in a dream, embraced a more austere manner of life. Many secrets were then revealed to her by God. She founded the monastery of Vadstena under the rule of our Saviour, which was given her by our Lord himself. At his command, she went to Rome, where she kindled the love of God in very many hearts. She made a pilgrimage to Jerusalem; but on her return to Rome she was attacked by fever, and suffered severely from sickness during a whole year. On the day she had foretold, she passed to heaven, laden with merits. Her body was translated to her monastery of Vadstena; and becoming illustrious for miracles, she was enrolled among the saints by Boniface IX. 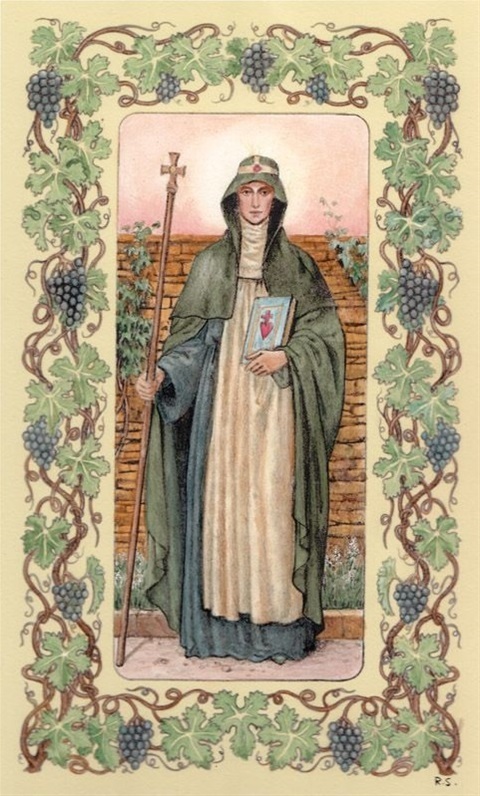 St. Birgit, more commonly called Bridget, or Brigit, was daughter of Birger, a prince of the royal blood of Sweden, legislator of Upland, and of Ingeburgis, daughter to Sigridis, a lady descended from the kings of the Goths. Both the parents spent their lives in fervent exercises of piety, and had a singular devotion to the sacred passion of Christ. Birger consecrated all Fridays in a special manner to practices of penance, and never failed on that day to confess his sins, and receive the holy Eucharist, endeavouring to put himself into such a disposition, as to be able to bear patiently all the crosses that might befal him till the next Friday. Ingeburgis was not less devoutly inclined, but died soon after the birth of our saint, which happened in the year 1304. Bridget was brought up by an aunt, who was a lady of singular piety. She did not begin to speak till she was three years old; and the first use she made of her tongue was to praise God: nor did she even in her childhood ever take pleasure in any discourse but what was serious. So strong and early was the grace of devotion with which God favoured her, that from her cradle all her views and desires tended only to piety, and in its exercises she found her greatest delight. No symptoms ever appeared in her of anger, spite, envy, jealousy, untowardness, or disobedience. She assisted assiduously at the church office, and at sermons. At ten years of age she was most tenderly affected by a sermon which she heard on the passion of Christ; and the night following seemed to see him hanging upon his cross, covered with wounds, and pouring forth his blood in streams in every part of his body; at the same time, she thought she heard him say to her, “Look upon me, my daughter.” “Alas,” said she, “who has treated you thus?” She seemed to herself to hear him answer, “They who despise me, and are insensible to my love for them.” The impression which this moving spectacle made upon her mind was never effaced; and from that time the sufferings of her Redeemer became the subject of her most assiduous meditation, even when she was at work at her needle, and she could scarce ever call them to mind without shedding abundance of tears. In obedience to her father, when she was only sixteen years of age, she married Ulpho, Prince of Nericia, in Sweden, who was himself only eighteen. This pious couple passed the first year of their marriage in continence, and having enrolled themselves in the third Order of St. Francis, lived in their own house as if they had been in a regular and austere monastery. They afterwards had eight children, four boys and four girls, who were all favoured with the blessings of divine grace. After the birth of these children, the parents, at the suggestion of St. Bridget, made a mutual vow of continency, and consecrated their estates more than ever to the use of the poor, whom they looked upon as their own family, and for whom they built an hospital, in which they served the sick with their own hands. Ulpho entered into the most perfect sentiments of virtue and penance, with which the example of his wife inspired him; and resigning his place in the king's council, and renouncing the court, he imitated her in all her devotions. To break all worldly ties by forsaking their country and friends, they made a painful pilgrimage to Compostella. In their return Ulpho fell sick at Arras. Bridget spared neither solicitude, pains, nor prayers for his recovery, and received an assurance of it by a revelation. He was accordingly restored again to his health, and arrived in Sweden, where he died soon after, in 1344, in the odour of sanctity, in the monastery of Alvastre, of the Cistercian Order, which rule, according to some, he had embraced, though others say that he was only preparing himself for that state. Bridget being by his death entirely at liberty to pursue her inclinations as to the manner of life which she desired to lead, renounced the rank of princess which she held in the world, to take upon her more perfectly the state of a penitent. Her husband's estates she divided among her children, according to the laws of justice and equity, and from that day seemed to forget what she had been in the world. She changed her habit, using no more linen except for a veil to cover her head, wearing a rough hair shift, and, for a girdle, cords full of knots. The austerities which she practised are incredible; on Fridays she redoubled her mortifications and other exercises, allowing herself no refection but a little bread and water. About the time of her husband's death, in 1344, she built the great monastery of Wastein, in the diocess of Lincopen, in Sweden, in which she placed sixty nuns, and, in a separate enclosure, friars, to the number of thirteen priests, in honour of the twelve apostles and St. Paul; four deacons, representing the four doctors of the church, and eight lay-brothers. She prescribed them the rule of St. Austin, with certain particular constitutions, which are said to have been dictated to her by our Saviour in a vision. The chief object of the particular devotions prescribed by this rule are the Passion of Christ, and the honour of his holy mother. In this institute, as in the Order of Fontevrault, the men are subject to the prioress of the nuns in temporals, but in spirituals the women are under the jurisdiction of the friars; the reason of which is, because the Order being principally instituted for religious women, the men were chiefly admitted only to afford them such spiritual assistance as they want. The convents of the men and women are separated by an inviolable inclosure; but are contiguous so as to have the same church, in which the nuns keep choir above in a doxal, the men underneath in the church; but they can never see one another. The number of religious persons in each double monastery is fixed as above; but most of the great or double monasteries which were situated in the North, were destroyed at the change of religion, with that of Wastein or Vatzen, which was the chief house of the Order. St. Bridget had spent two years in her monastery at Wastein when she under took a pilgrimage to Rome, in order to venerate the relics of so many saints which are honoured in that city, and especially to offer up her fervent prayers at the tombs of the apostles. The example of her virtue shone forth with brighter lustre in that great city. The austerity of her watchings and penance, the tenderness of her devotion, her love of retirement, her fervour in visiting the churches, and in serving the sick in the hospitals, her severity towards herself, her mildness to all others, her profound humility and her charity appeared in all she did. Remarkable monuments of her devotion are still shown in the Church of St. Paul, and other places, at Rome and in its neighbourhood. For the thirty last years of her life, she was accustomed to go every day to confession, and she communicated several times every week. The frequent use of the sacraments kindled every time fresh ardour in her soul. Nothing is more famous in the life of St. Bridget than the many revelations with which she was favoured by God, chiefly concerning the sufferings of our Blessed Saviour, and revolutions which were to happen in certain kingdoms. It is certain that God, who communicates himself to his servants many ways, with infinite condescension, and distributes his gifts with infinite wisdom, treated this great saint and certain others with special marks of his goodness, conversing frequently with them in a most familiar manner, as the devout Blosius observes. Sometimes he spoke to them in visions, at other times he discovered to them hidden things, by supernatural illustrations of their understandings, or by representations raised in their imagination so clearly that they could not be mistaken in them; but to distinguish the operations of the Holy Ghost, and the illusions of the enemy, requires great prudence and attention to the just criteria or rules for the discernment of spirits. Nor can any private revelations ever be of the same nature, or have the same certainty with those that are public, which were made to the prophets, to be by them promulgated to the church, and confirmed to men by the sanction of miracles and the authority of the church. What is most of all praiseworthy in St. Bridget is, that in true simplicity of heart she always submitted her revelations to the judgment of the pastors of the church; and deeming herself unworthy even of the ordinary light of faith, she was far from ever glorying, in any extraordinary favours, which she never desired, and on which she never employed her mind but in order to increase her love and humility. If her revelations have rendered her name famous, it is by her heroic virtue and piety that it is venerable to the whole church. To live according to the spirit of the mysteries of religion, is something much greater and more sublime than to know hidden things, or to be favoured with the most extraordinary visions. To have the science of angels without charity is to be only a tinkling cymbal; but both to have charity, and to speak the language of angels, was the happy privilege of St. Bridget. Her ardent love of Jesus Christ crucified moved her to make a painful pilgrimage to visit the holy places in Palestine, where she watered with her pious tears the chief places which Christ had sanctified by his divine steps, and purpled with his adorable blood. In her journey she visited the most renowned churches in Italy and Sicily, with a devotion that excited all who saw her to fervour. Being returned safe to Rome, she lived there a year longer, but during that interval was afflicted with grievous distempers, under which she suffered the most excruciating pains with an heroic patience and resignation. Having given her last moving instructions to her son Birger, and her daughter Catherine, who were with her, she was laid on sackcloth, received the last sacraments, and her soul, being released from its prison of clay, took its flight to that kingdom after which she had always most ardently sighed, on the 23rd of July, 1373, being seventy-one years old. Her body was buried in the Church of St. Laurence, in Panis Perna, belonging to a convent of Poor Clares; but a year after her death, in July, 1374, it was translated to her monastery of Wastein, in Sweden, by the procurement of her son Birger and St. Catherine (of Sweden). She was canonized by Boniface IX in 1391, on the 7th of October, and her festival is appointed on the day following. At the petition of the clergy and nobility of Sweden, the general council of Constance examined again the proofs, and unanimously declared her enrolled among the saints on the 1st of February, 1415. Her canonization was again confirmed by Martin V in 1419. The life and sufferings of our divine Redeemer are the book of life, in which both souls which now begin to serve God, and those who have long exercised themselves in the most perfect practices of all heroic virtues, find the most powerful incentives and means of spiritual improvement. The astonishing example which our most amiable and adorable Saviour here sets us of infinite meekness, patience, charity, and humility, if seriously considered and meditated upon, will speak a language which will reach the very bottom of our hearts, and totally reform our innermost affections and sentiments. That inordinate self-love and pride which by the contagion of sin seems almost interwoven in our very frame, will be beat down to the very ground; the poison of our passions with which our souls are so deeply infected in all their powers, will be expelled by this sovereign antidote; and sincere compunction, patience, humility, charity, and contempt of the world will entirely possess our affections. The more a soul is advanced in the school of all Christian virtues, the more feelingly she will find every circumstance in these sacred mysteries to be an unfathomed abyss of love, clemency, meekness, and humility, and an inexhausted source of spiritual riches in all virtues. By this meditation she will daily learn more perfectly the spirit of our Divine Redeemer, and put on that blessed mind which was in Christ Jesus. In this interior conformity to him consists the reformation and perfection of our inner man: this resemblance, this image of our divine original formed in us, entitles us to the happy portion of his promises.